Hi there! Here with another review of something i’ve been loving lately. And that’s the Dior Cheek & Lip Glow from their spring release. I find this product has earned it’s place in my weekend makeup and vacation makeup routines. It’s fuss free and lasts all day if done right. Since this is Dior’s very first cheek and lip ‘blush’, i’ll start with packaging. 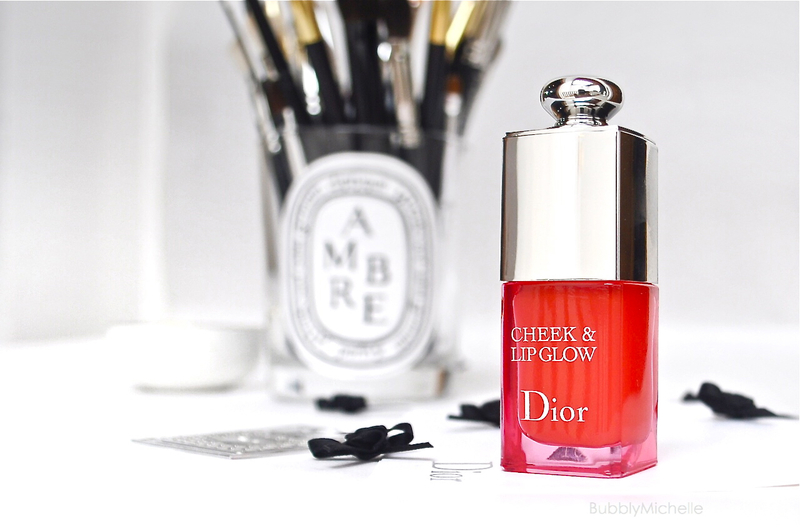 The Cheek & Lip Glow comes in a bottle similar to nailpolish. It’s glass and the silver top comes off to reveal the applicator. Unscrewing the bottle cap we find a spongy round applicator which feels super soft and plush. Very user friendly and also leak proof in case you want to take this along in your makeup bag. The liquid is a thickish gel consistency and smells minty. Application is pretty straightforward, just go directly onto the lips with the ball applicator and let it dry. You’d notice it leaves a slight tingling sensation as it dries, similar to lip plumping glosses. Those of you with very sensitive lips might want to pass on this one. 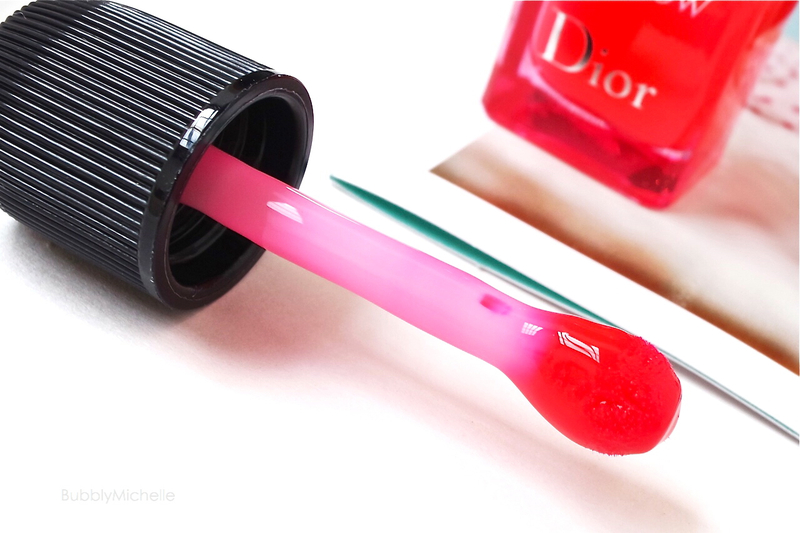 For the cheeks the method suggested by Dior is to lightly wipe the ball applicator on the edge of the bottle to obtain just the right amount of product and apply on the cheeks with circular motion and quickly blend with fingertips. I on the other hand, like to pick up product with my fingers and lightly tap and blend on the cheeks. I do this mostly to make sure my foundation is not disturbed during application. But I find my method does take a bit of extra work layering on the product. As you can see, the product looks very bright once appied, but the stained swatch is much less intimidating! Of course you can always reapply a few times to build up intensity! Specially if you are looking for a much brighter lip colour :-). It’s a very versatile product in that sense. I find this product wears really well, almost all day. However since this is something that doesn’t offer any hydration (it’s solely for staining), it’s good practice to layer over with either a clear gloss or a balm. Reapplying the balm would keep your lips hydrated and looking fresh all day. I also love that this leaves such a beautiful rosy tint that almost looks just like your lips, but prettier. And since it doesn’t wear off, you can fool anyone into thinking this is your own lip colour! Overall this is a great product to have on hand when you are too busy for touchups and deal with fading etc. Great for off days running errands IMO and I also love this for the beach as well. Non fussy colour that your hair doesn’t stick to! Here’s a look at how this shows up on the lips. I’ve worn it on the cheeks too, but it’s so faint in the photo (I always ‘under do’ blush!) you could totally miss it. In real life it leaves a very nice slight rosy tint, minus the powderiness you get with other blushes. This is by far the best tint lip and cheek product i’ve tried to date. No need to rush to blend it out like the Benetints by Benefit. You most certainly have more ‘play time’ while application before this starts to set and stain since it’s a gel formula and not a liquid, it takes a while to evaporate I guess. I find the colour too is universal, and I totally get why they came out with just one shade. It’s also perfect for mimicking the rosy cheeks you get coming out of winter yet sweet and girlie for spring. The only downside I could think of was that it was a product that gives you no hydration. Currently available at all Dior counters. For more Dior Spring 2015 reviews, click here. Yeah, I don’t normally like to buy things without really getting a feel for it. Will you be picking one up? 🙂 And what else have you been trying these days? I probably will be passing on this for now because I am trying to use up a ton of untouched makeup I am hoarding ! For now I am absolutely loving the Burberry Foundation, it feels great for my dry skin and I love the finish. Also obsessing over the NARS dual intensity blushes ! I have the same problem! But I can’t stop buying… >.< And super excited for my Nars blushes to arrive! it's gonna be so much fun playing with these! Ah this is soo gorgeous!!! Where’d you get your necklace if you don’t mind me askin.